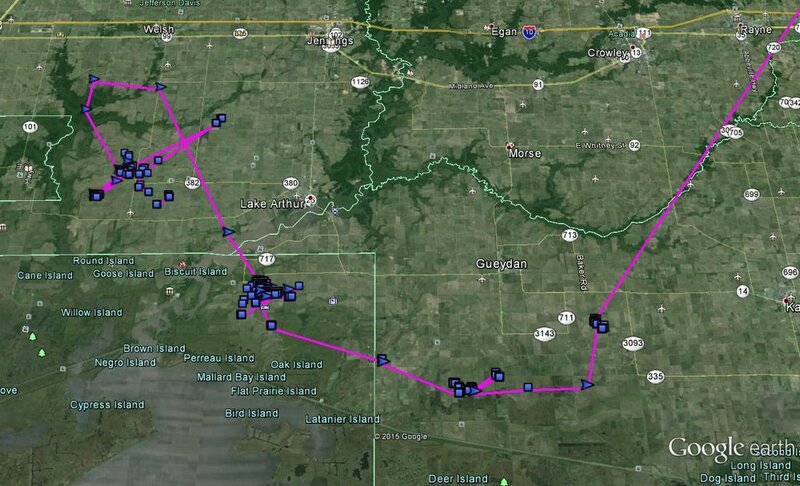 Winter ecology, habitat use, and local and long-range movements of Greater White-fronted Geese (GWFG) captured in Louisiana. Quantify use of habitats by GWFG in Louisiana during fall and winter. Ground-truth selected habitats within Louisiana to identify vegetation type and height, water depth, type and estimated numbers of waterfowl present, and other variables of interest. Determine the availability of habitat types within the study area using remotely sensed databases and compare use of selected habitats with their landscape availability. Assess changes in selected habitats from historic landscape databases, including investigating variation of Mid-Winter GWFG counts in Louisiana. Compare local movements and habitat use during pre-hunting, hunting, and post-hunting seasons to assess the effect of open hunting seasons. Evaluate large-scale movements after arrival in Louisiana including within the first fall and winter, spring and fall migration, and subsequent years throughout the life of the transmitter. We will radiomark GWFG on important wintering areas. Birds will be tracked across North America. GWFG will be opportunistically captured using rocket nets. All captured birds will be banded and selected adults will be fitted with neck-collar mounted radiotransmitters. Efforts will be made to avoid marking multiple individuals from single family units. All captured birds will be released at their capture location within 30 minutes. Transmitters will be programmed to collect GPS locations ≥48 times per day and will attempt to transmit those data via cellular service once per day. Transmitters have a life expectancy of up to 3 years. GWFG are common fall and winter residents in agricultural and coastal habitats of SW Louisiana. According to mid-winter estimates, GWFG increased from an average of 30,000 in the 1960’s to an average of 103,000 during the 1990’s. In the last 20 years, mid-winter estimates for GWFG in Louisiana varied from 55,000 to 150,000 and averaged about 95,000. During that same time, Mississippi Flyway mid-winter estimates have more than doubled; however, Louisiana now winters only 20% of the Flyway GWFG compared to 80% just 20 years ago. During this same time period, active waterfowl hunters in Louisiana declined from about 90,000 in the late-90’s to a low of 56,000 in 2005, and then steadily increased to >100,000 in recent years. Increasing mid-winter counts are being reported in Illinois, Missouri, Tennessee, Arkansas, and Mississippi. Managers and hunters of this popular species are concerned about this northward shift in winter distribution. This study will provide data to quantify habitats important to GWFG, better understand timing of migration, assess site fidelity, guide habitat programs, and inform management and regulatory decisions.